Beijing has a time-honored history of producing various kinds of snacks. In the Chinese history Beijing served as the capital of China in the Kin (1115-1234), Yuan (1279-1368), Ming (1368-1644) and Qing (1644-1911) dynasties, totaling 700 years or so. With strong local flavors, Beijing's snacks attract almost all visitors. Snacks of Beijing can fall into three varieties: Han, Hui and imperial snacks, which are generally prepared by steaming, deep frying, frying in shallow oil, and instant boiling. Some people regard snacks of Beijing as "living fossils." Now snack restaurants can be found all over Beijing, such as Longfusi and Huguosi snack counters. Quick boiled Tripe Man, Chatang Li and Wonton Hou. Typical Beijing snacks: Douzhi (mung bean milk), Jiaoquan (crisply fried ring of dough), Aiwowo (steamed cone-shaped cake made of glutinous rice or millet with sweet filling), Chatang (paste or custard made of millet or sorghum flour), Ludagun (pastry made of steamed glutinous millet flour or soy bean flour mixed with sugar), sweet baked cakes, pea flour cakes, walnut cakes, small corn buns, eight-treasure rice, fried cakes made of glutinous rice flour, etc. Prepared with white peas, pea flour cake is a typical snack in spring. Pea flour cakes. 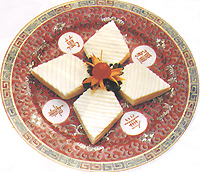 kidney bean cakes and small corn buns were well-known imperial snacks in ancient China. 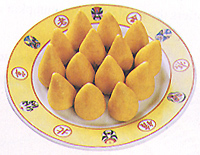 Steamed cone-shaped cakes made of glutinous rice or millet with sweet filling firU appeared in the Yuan Dynasty, and were well received by the imperial families in the Ming, Dynasty. Now it is one of Beijing's snacks loved by local people. Beijing has a long history of making mung bean milk. As early as in the Liao (907-1125) and Song (960-1279) dynasties, mung bean milk was very popular. Local people of Beijing love to drink mung bean milk, because it is rich in protein, vitamin C and rough fiber and helps drive away summer heat, invigorate the function of the spleen and whet the appetite. People in Beijing love to eat sweetened fried flour gruel because it is tonic. As one of the ancient snacks of Beijing, Ludagun is mainly made of soy bean flour mixed with sugar. It is a popular snack in Beijing.